What do you do for a bride and groom who don’t like cake? Donuts! I take no credit for this cake other than assembly. The bride found photos and inspired the concept. This was quick, easy, and completely fun to put together. The support structure is made of cardboard cake rounders separated by styrofoam cake dummies. Florist ribbon around each piece made it look nice and finished. 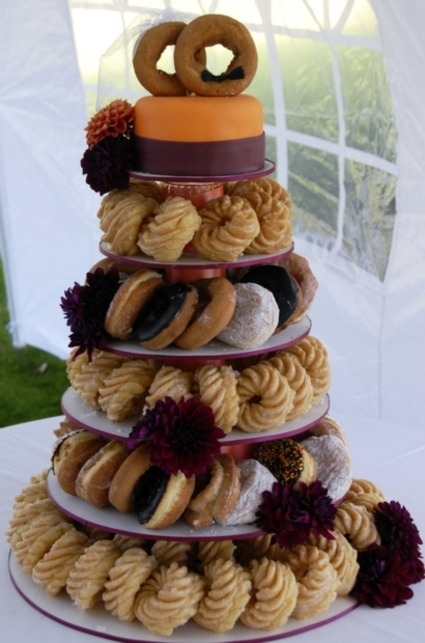 I used fresh flowers to make the donut tower look more like a cake. 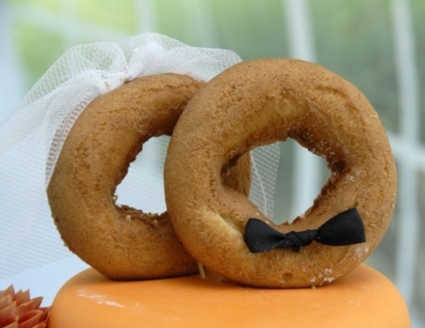 This is the cutest cake topper idea ever. I couldn’t think of anything better to top this cake. All credit goes to my sister-in-law and Mother of the Bride that day. It was a big hit.